"A Sweet Delight for Purim. It looks and sounds a lot like Joseph and the Amazing Technicolor Dreamcoat but the great surprise is that The Orphan Queen achieves a genuine pathos and humanity that Joseph never even approached." "Writer-composer Robbie Solomon's The Orphan Queen sends a strong feminist message about women's finest hour in the Bible and entertains theatergoers with compelling musical fare." 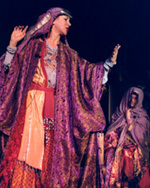 The Orphan Queen is a play, retelling of the Biblical story of Esther. It is the basis of the Jewish holiday of Purim, a word meaning fortune, or lots. 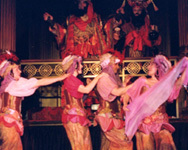 It takes place in Persia during the reign of King Ahashverosh, a man fond of raucous parties. Act One opens as a Chorus introduces the story and its philosophy (Chance). The Narrator begins (Bigthana And Theresh) with an account of an ill-fated assassination plot against the King. The plot is discovered and stopped at its inception by Mordechai the Jew. This little incident is forgotten amid all the revelry (Everybody Loves A Party), until much later when it becomes an important element in the second act. 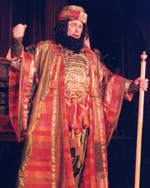 Mordechai doubles as a character in the story and the present-day Rabbi Mordechai, who chants the Megilah, the scroll of Esther, and teaches a group of children. The children continue the narration, (In The Days Of Ahashverosh) and later ask him questions which he answers in song. At the end of seven days of feasting the Kings chief minister, Haman, persuades Ahashverosh to order his wife, Queen Vashti, to entertain the drunken guests. Her refusal (I Am A Woman) leads to her banishment, and her escape leaves the King and Vashti wondering how it all got so out of control (What Was I To Do?). The King realizes that he now misses his queen, but Haman has a solution. They will hold a beauty pageant (The Beauty Contest) in which Ahashverosh can choose a new queen from among the beautiful maidens of the kingdom. Now Mordechai the Jew has a young charge, his cousin Esther, formerly Hadassah, whom he brought with him from Babylonia after she was orphaned. He encourages her to enter the beauty contest, (You Are Extraordinary) and after some resistance she does (Just A Mystery) and wins the Kings heart. Esther hides from her husband the fact that she is Jewish (A Happier Tune) and while this arrangement works very well at first, things turn bad when Mordechai runs afoul of the minister Haman, to whom he refuses to bow down. Haman vows revenge not only on Mordechai but on his people as well. He writes an edict for the king to sign, condemning all the Jews to death, and he draws lots, purim, to pick a date for the execution--it falls on Adar 13. Now Haman is feeling very powerful and struts around the castle (Prince Of Deception), ending up in the throne room where he has arranged to meet with the King about the Mordechai problem. He then uses his verbal acuity (Pick A Card) to trick Ahashverosh into signing the edict. A gallows is specially built to hang Mordechai (Building The Gallows). The Jews of the town cry out (What Have You Done? !), and appeal to Esther to save them. She knows that it is against the law to come unbidden to the King, punishable by death. So she asks her people to fast and pray with her (Esthers Prayer). Act One ends with Mordechai proclaiming his belief that the universe is guided by more than the vagaries of Chance, and that life has a purpose (I Believe In Life). Act Two opens as King Ahashverosh, during a sleepless night, orders his scribe to read to him from his book of the chronicles. It reveals that a certain Mordechai had saved the Kings life by unmasking the assassination plot of Bigthana and Theresh. Ahashverosh calls in his ministers and Haman to determine how to reward this hero (How Shall I Honor The Man?). Haman thinks it is he, himself, who is to be honored, and devises a big parade as the reward. Meanwhile Esther discovers (Rumors And Innuendoes) that Vashti, the banished queen, is hiding out as a fortune teller in the Bazaar. 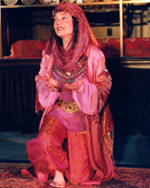 She goes in disguise to seek her help in dealing with Ahashverosh (Man Trouble) and the two women find much in common (Just A Mystery). Esther promises to protect the banished queen, and Vashti gives Esther some sisterly advice (Mans, Mans World). Thus fortified, Esther goes in to see the King. 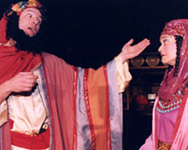 Although at first he is confused by her uncharacteristic forwardness (What Am I To Do), he accepts her into his chambers by raising his scepter. Taking Vashtis advice, Esther invites Ahashverosh to a special feast she will prepare and specifies that Haman should come too. The next morning the King reports his odd encounter to Haman (Im Disturbed), and then reminds him of the upcoming celebration to honor the man (Purim Parade) for whom he, Haman, has the task of leading Mordechais horse. Haman exits the parade in humiliation, (His Anger And Shame) but he is buoyed by the fact that the next day is Adar 13, the day of Mordechais scheduled execution; and furthermore, he has been invited along with the King to attend Esthers special feast that very night. Esther meanwhile is busy setting up her dinner party (Suppertime Solution) at which she reveals her secret that she is a Jew. Here she denounces Haman (Everybody Loves A Party) and Haman is sent off to hang on the gallows he had built for Mordechai. Realizing how close he had come to losing her, Ahashverosh professes his love for Esther, and she for him (You Are Extraordinary). Mordechai is appointed to be the next chief minister, and he declares a holiday, Purim, on the 14th of Adar to celebrate his faith in life (I Believe In Life).